Are you thinking of buying a life insurance policy for yourself or your family members? Are you wondering if Protective is a proper choice for you? If you are, you have come to the right place. In this review, we take a detailed look at Protective Life Insurance, discuss its strengths and weaknesses, and take an in-depth look at the policies offered by the company. Protective Life and Annuity Insurance Company was established in 1907 by William Dorsey Jelks, who was the former governor of Alabama. The company started expanding its presence rapidly in the following years and had insurance policies worth over $65 million in force by 1932. By 1957, the company had policies worth over $1 billion in force. Over the years, Protective Life Insurance has acquired a number of companies including West Coast Life Insurance Company, Chase Insurance Group, and MONY Life Insurance Company. Currently, the company has a solid presence in all 50 states of the country and has over $75 billion in assets. The company is still located in Birmingham, Alabama. It is frequently cited as one of the best life insurance companies in the US. Financial stability is one of the important factors you need to take into account while choosing an insurance provider. You can determine an insurer’s financial strength based on their ratings. Let us now take a look at the current ratings and financial security of Protective Life Insurance Company. 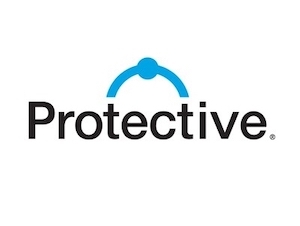 Protective has managed to receive an ‘A’ rating or above from all four agencies over the years, which is a claim that very few companies in the country can make. Protective is a very financially secure company. Protective offers a term life insurance policy called Classic Choice, which is affordably priced and is designed to cover you for a specific time period. Let us take a look at the key features of the policy. You can choose a term length based on your needs – anywhere from 10 to 30 years. The death benefit starts at $100,000 and can be as high as $50,000,000. It is a level-premium product, which means you pay the exact same amount month after month, year after year – until the end of your policy’s term. If, at any point during the policy’s term, you decide that you need lifelong coverage, you can have your term policy converted into a permanent policy. There is no need for any medical tests and you can retain the risk class that was originally assigned to you by the company. One of the biggest advantages of Protective’s Classic Choice policy is that it is extremely affordable. If you are a 30-year old man who does not smoke and is in good health, a 10-year, $100,000 policy is likely to cost you just over $7 a month. It is way cheaper than the term policies offered by most other companies. Protective offers a terminal illness rider for its term life policyholders. The rider basically converts the death benefit into a living benefit in the event of a terminal illness diagnosis. A portion of your policy’s death benefit is paid out to you in the form of monthly payments, which you can use to pay for your treatment. Lifetime coverage as long as the premium payments are made regularly. Level premium payments – no increase or decrease throughout the policy’s duration. A cash value account which earns interest at a fixed rate throughout the policy’s duration. The option to borrow against the policy’s cash value portion. Apart from this, Protective also offers a whole life policy which is designed for young children. The coverage amount ranges from $10,000 to $100,000. The application process is extremely simple and there are no medical tests involved. The coverage amount is set to double on the 18th birthday of your child or grandchild at no additional cost. The ownership of the policy is automatically transferred from the guardian (you) to your child or grandchild, when he or she reaches the age of 21. The policy’s cash value account keeps growing in value throughout the coverage period. The money can be used by your child or grandchild for a variety of purposes – college tuition, down payment for a house, capital for a small business, and more. It can even be used as collateral for a business or personal loan. The policy allows you to lock in extremely low rates (in terms of premium) right at the start of the coverage period. The rates do not increase as your child or grandchild grows up. Protective’s child whole life policy offers a great deal of flexibility in terms of premium payments. You can choose level pay (pay the same amount on a monthly or yearly basis throughout the coverage period) or single pay (pay the entire premium amount in a lump sum). Protective offers four different types of universal life policies, each of which offers a unique set of benefits. This is a uniquely structured and affordably priced universal life policy offered by Protective. Given below are the policy’s key features. The policy’s coverage period can range from 10 to 30 years. The premium payments are considerably lower than what you typically pay for a universal life policy. They also remain unchanged during the coverage period. Once the initial coverage period ends, the policy still stays in effect. You still have to pay the same premium, but the death benefit gets reduced steadily. At the end of your policy’s term, you can choose to get permanent coverage without undergoing a medical examination. Protective’s variable universal life policy offers the following benefits. A minimum guaranteed death benefit, which does not get reduced throughout the policy’s duration – as long as the premium payments are made in a timely manner. Premium payments are not fixed – you can choose to reduce or increase the premium from time to time, depending on your income level and financial obligations. You can use the money in your cash value account to pay for the premiums. You can use the money in your cash value account for your financial needs from time to time by taking out a loan. You have the option of investing the money in your cash value account in the stock market. It means higher returns when the market is on an upward trajectory and lower returns when the market tanks. The company offers a number of investment options, each with its own benefits and risks. Ultimately, you get to decide where your money goes. Protective’s indexed universal life policy offers the following benefits. Lifelong coverage and death benefit. Two cash value accounts – one which earns a fixed rate of interest and another one whose growth is based on the performance of a market index. There is no fixed premium – you can choose to pay more or less, depending on your income level and financial obligations from time to time. Guaranteed downside protection – the money in the cash value account continues to earn interest at a fixed rate, irrespective of market conditions. The biggest advantage of Protective’s indexed universal life policy is that the cash value account has the potential to grow at a much faster rate compared to the cash value component of a regular universal life policy. Unlike a variable universal life policy, there is no risk of a negative return on your investment in the event of a market crash. Thanks to the downside protection feature, your account continues to accrue interest even during a downturn or crash. Protective’s survivorship universal life policy offers the following benefits. A single policy is designed to cover two individuals (typically a married couple). It is far more affordable than buying two separate policies. Offers lifetime coverage for both policyholders. If you or your spouse/partner finds it hard to qualify for a life insurance policy individually, you can both sign on the dotted line for a survivorship policy, since it’s a lot easier to qualify for. The death benefit is paid out on the death of the second policyholder. It can be used for a wide range of purposes like funeral expenses, estate taxes, outstanding bills, and a number of other expenses. If the couple who bought the policy together decides to separate, the existing policy can be converted into two separate policies with a reduced death benefit. The cash value component grows in value throughout the policy’s term. The interest rate is determined by the insurance provider. You can access the accumulated cash in the account for any purpose, at any time you want – by making a withdrawal or by taking out a loan. The company offers a number of riders to enhance the protection offered by their life insurance policies. They include critical or terminal illness rider, disability income rider, accidental death rider, waiver of premium rider, and many more. Protective has been in the insurance business for over a century now and is one of the most established names in the industry today. The company pays out millions in claims every year and has a track record of settling claims in a timely manner. It is undoubtedly one of the most financially stable and reliable insurance providers in the United States. Protective’s life insurance policies are competitively priced. The company’s term life policies, in particular, are cheaper than the policies offered by most other companies. Protective offers two different types of whole life policies – one for adults and one for young children. The company also offers four different types of universal life policies – a unique, affordably priced universal life policy, a variable universal life policy, an indexed universal life policy, and a survivorship universal life policy. Protective’s underwriting guidelines are lenient towards people with certain preexisting conditions like diabetes and heart disease. Protective’s approval process is quite long, which is something that many customers have complained about. Protective’s underwriting policies are quite strict when it comes to smokers. You can qualify for preferred rates only if you are a non-smoker or if you are someone who has quit the habit and has not smoked in the last five years. If you happen to be a casual smoker, you cannot qualify for preferred rates at all. The company is slightly more lenient towards cigar smokers. You are allowed to smoke up to six cigars a year for celebratory purposes. You have to admit to cigar use during the application process. Also, your urine sample should not contain any traces of nicotine. Is Protective the right insurance company for you? Protective is well-known, reliable, and financially stable. Its term life policies are extremely affordable and it offers a wide range of choices in terms of permanent life policies. If you are in need of a term life policy, Protective might be the right choice for you. When it comes to permanent life policies, however, there are many other companies whose products are just as good as, if not better than, what Protective offers. Similarly, if you are a non-smoker, Protective is an excellent choice for you, since you can qualify for the lowest rates possible. If you smoke, you should consider buying life insurance from companies that are lenient towards smokers. When it comes to life insurance, noexam.com is your trusted partner and guide. Our experts know the insurance industry inside out and can help you make the right choices in terms of policies as well as insurance providers. So, if you have any question related to life insurance, you can get touch with us at NoExam.com.